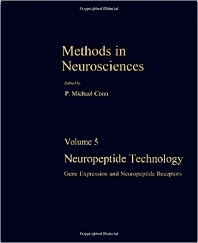 Methods in Neurosciences, Volume 5: Neuropeptide Technology: Gene Expression and Neuropeptide Receptors discusses procedures and tools of assay useful for the identification, purification, and quantification of neuropeptides and their receptors. This volume is divided into two sections—neuropeptide gene expression and neuropeptide receptors. In these sections, this book specifically discusses the assays for peptide products of somatostatin gene expression; molecular assays for rat thyrotropin-releasing hormone gene; and structure, expression, and chromosomal localization of human gene. The gastrin-releasing peptide or mammalian bombesin; semiquantitative analysis of cellular somatostatin mRNA Levels; and atrial natriuretic factor receptor assays are also elaborated. This text likewise covers the receptors for opioid peptides in brain and autoradiography of somatostatin receptors in rat cerebellum. This publication is beneficial to neuroscientists and students intending to acquire knowledge of gene expression and neuropeptide receptors.